Boston is a major hub for bus transport in New England, and to New York City. 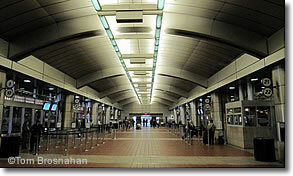 Boston's South Station Bus Terminal is the busiest in New England. Here is a list of cities and towns served by buses from Boston, with abbreviations of the names of the bus companies running these routes. Click on the name of the company, or the two-letter abbreviation, for more information, schedules, timetables, fares, and online reservations. Above, South Station Bus Terminal, Boston MA. 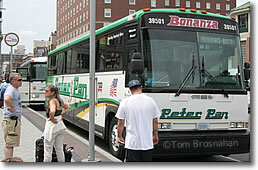 Below, Peter Pan/Bonanza, the most prominent intercity bus lines in New England.